VNC or Virtual Network Computing is a graphical desktop sharing tool that allows you to control a computer (server) remotely from another computer (client). A VNC server transmits all keyboard and mouse events from the client computer to the server computer. If you’re not yet comfortable with the CLI things like terminal etc, you can use VNC to make easier things like managing files, software, and system settings. In this tutorial, we will guide you step-by-step to set up the VNC server on Ubuntu 16.04. We will install a Linux Desktop XFCE on the server, then install and configure the VNC server using TightVNC. Update your Ubuntu repository, then upgrade your system using the apt commands below. For this guide, the VNC desktop will be available for a non-root user. So, we need to create a new user and add it to the sudo group for root access. Create a new user named ‘edward’ and give the user a password. 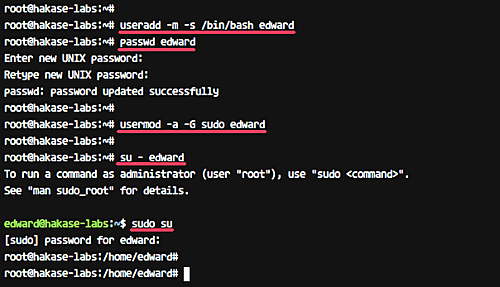 Now add the ‘edward’ user to the sudo group for the root privileges access. 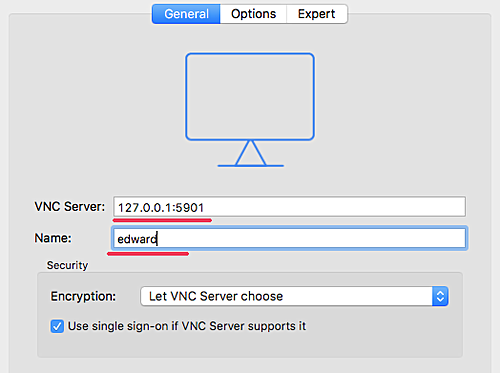 A new user named ‘edward’ for VNC access has been created, and the user will be able to access the root privileges. Linux has several desktop environments such as Gnome, Unity, KDE, LXDE, XFCE etc. For this tutorial, we will be using the XFCE desktop as our VNC desktop environment. Install XFCE desktop including all dependencies using the apt command below. If the XFCE desktop installation is complete, install the ‘tightvncserver’ packages. Run the apt command below. The XFCE Desktop and tightvncserver have been installed on the Ubuntu 16.04 server. In this step, we will generate the VNC configuration for the ‘edward’ user. 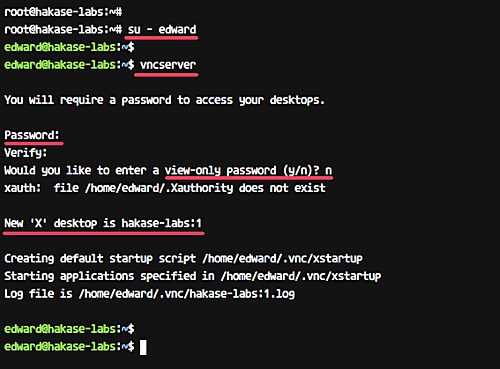 Now initiate the vnc configuration for ‘edward’ user with command below. 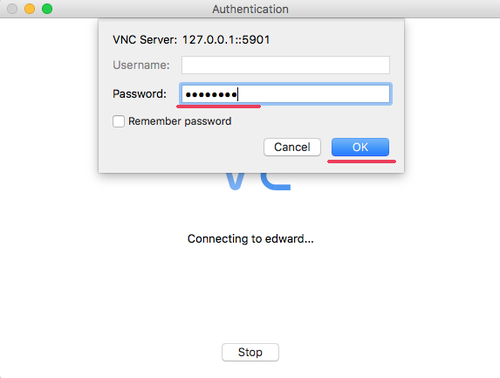 You will be asked for the VNC server password – type your password. And for the ‘view-only’ password, you can enable or disable it. The user who logins to the server using the ‘view-only’ password will not be able to control the mouse and keyboard. The first time we run the ‘vncserver’ command, it will automatically create new configuration directory ‘.vnc’ and run the first VNC session. In this step, we will configure the VNC server for using the XFCE desktop. We will edit the VNC configuration file ‘xstartup’ under ‘.vnc’ directory. Before we edit the configuration, kill the first VNC session using the command below. 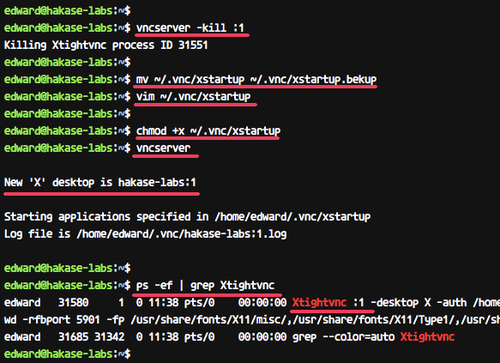 Now make the script executable using chmod and run again the ‘vncserver’ command. In this tutorial, we will run the VNC server as a service. So we need to create a new service file for it. Go to the ‘/etc/systemd/system’ directory and create a new service file ‘vncserver@.service’. Paste the following vnc service script there. Now reload the systemd services and start the VNC server service. Assuming everything goes error-free, add the service to the boot time and check the service status using systemctl. The VNC server is installed, and the first session is now running under ‘edward’ user. In this step, we will connect to our VNC server through an ssh tunnel. Open your terminal and type the ssh command as below. Type your SSH login password. The command will create the tunnel between your localhost and the VNC server. The port 5901 on localhost will be forwarded to the VNC server ‘192.168.33.10’ on port 5901. Now open your ‘vnc viewer’ application, create a new connection, and type the VNC server address with the 127.0.0.1 localhost IP and port 5901 as below. Installation of the VNC server using TightVNC on Ubuntu 16.04 has been completed successfully.